If you've been visiting Lippy in London for a while, you may have noticed that I've featured a few products from Notting Hill based Medispa and Online Boutique Beauty Works West. What you may not know however, is that Beauty Works West is also a brand in itself, offering a range of scrumptious body, hair and bath products as well as beautiful candles. The luxurious concoctions were all developed by world renowned anti-ageing expert, Dr. Daniel Sister, so you know you're in very capable hands with these gorgeous products! I've been trialing the Anti-Ageing Body Cream and the Cleanse Organic Facial Cloths and I'm so pleased with the performance and all round gorgeousness of these products that I wanted to share my thoughts. This fresh, thick and decadent body cream is pure luxury in every way. Made with super nourishing Cocoa Seed and Shea Butter, this cream is very rich yet quickly absorbed, leaving the skin incredibly soft and smooth without the grease factor. The scent is a gorgeous, long lasting citrus heavy, slightly spicy concoction that keeps the skin smelling lovely and fresh - even during perilous Tube journeys in June. The Anti-Ageing Body Cream is £41.50 for a generous 225ml tub of luxury. Have a closer look at the body cream at www.beautyworkswest.com or click here. I get home from work close to midnight some evenings, so I'm a huge fan of using facial wipes to remove make up and impurities quickly and easily. I do however have trouble finding wipes that don't irritate my skin to the point where I have to get out of bed and wash of the residue and this is why I love these. 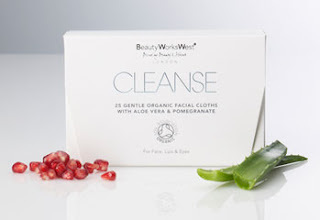 These organic cleansing wipes are infused with soothing Aloe Vera and anti-ageing Pomegranate extracts, so they comfort my face rather than infuriate it and they're so gentle I can even use them to remove mascara and eyeliner. When I find a facial wipe that doesn't irritate my eyes, I'm not going to forget about it anytime soon and I think these are just perfect. The wipes retail at £7.95 for a box of 25 and you can find them by clicking here. Along with the Beauty Works West branded products, you can also find a range of beautiful products from other brands by visiting the company's online boutique. They stock all kinds of gorgeous goodies including La Bella Donna mineral make up and the iconic Egyptian Magic all purpose skin cream.